On Christmas morning, I like to start off the day with some fruit and something fresh from the oven such as madeleine's, panettone or stolen. Sure, later on there will be bacon, sausages and the works, but I'm talking about early in the morning, with my coffee and presents, I like warm baking. This holiday I believe I will be turning out Nigella's Christmas Morning Muffins for our little family. Perfumed with the zest from the clementines and sweetened with the juice, these muffins are rightly named. Red cranberries give them some holiday color and as they are full of spices, they give the kitchen a wonderful smell when they are baking. I'm loving my new cookbook, Nigella Christmas, which was an early present from Danny. (Here Jasmine reviews the cookbook) I'm doing her Stuffed Loin of Pork with Rubied Gravy for Christmas Eve dinner: pork loin stuffed with bacon and cranberries and wrapped in bacon. How amazing is that?! This is my first Nigella cookbook, and hmm, she really loves her bacon. We'd get along great. Here's the recipe. I've cut back on the amount of dried cranberries and am temped to throw some dark chocolate chunks in next time. It IS Christmas, after all. Preheat the oven to 400F. Line a muffin with papers and set aside. Measure the flour baking powder, baking soda, sugar, and spices into a large bowl; grate the zest of the clementines over and combine. If you are doing this in advance, leave the zesting till Christmas morning. Squeeze the juice of the clementines into a measuring jug and pour in the milk until it comes to the 200ml mark. Add the oil or butter and egg, and lightly beat until just combined. Pour this liquid mixture into the bowl of dried ingredients and stir gently until well combined. 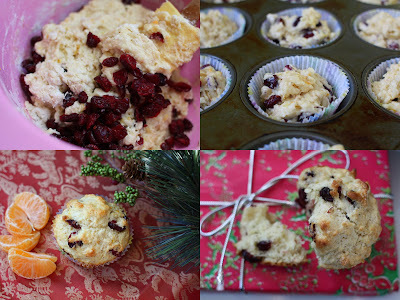 Fold in the cranberries, then spoon the batter into the muffin tins. Sprinkle with demerara if desired. Bake for 20 minutes or so until tops are firm to the touch. Congratulations to Terrie (Mom/Grandma T) and Walter on your marriage! We love you and wish you every happiness together as you turn the page on this new chapter in your lives. I probably should be doing something else right now like packing a healthy snack for tomorrow's little ring bearer, or ironing his baby brother's wedding pants. The clock is ticking toward midnight and I'm going to have bags under my eyes and ugly fingernails at tomorrow's family wedding, because instead of being responsible, I am bringing you this panettone. Turns out it was a bit of a photographers dream too...It posed so prettily, even when sliced open to reveal it's creamy interior. This wedge disappeared pretty fast with my cup of tea. Luckily the recipe makes a big batch, so there's some in the freezer for Christmas morning. In a glass measuring cup, microwave rum at high for about 20 seconds. Add raisins and let stand until plump, about one hour. Drain and reserve raisins. In small bowl, combine raisins, candied peel and citron. Add 2 tbsp (25 mL) of the flour; toss to coat. Set aside. In separate bowl, dissolve 1 tsp (5 mL) of the sugar in warm milk. Sprinkle in yeast; let stand for 10 minutes or until frothy. Whisk together eggs, egg yolks, orange and lemon rinds and vanilla until combined; stir into milk mixture. In large bowl, stir together 4 cups (1 L) of the flour, remaining sugar and salt. With wooden spoon, stir in egg mixture all at once. Add butter all at once; stir until blended. Gradually stir in remaining flour to make soft somewhat lumpy dough. Turn out dough onto lightly floured surface; knead for about 8 minutes or until soft, smooth and elastic, adding up to 1/3 cup (75 mL) more flour if needed. Lightly dust with flour; cover with tea towel and let rest for 5 minutes. 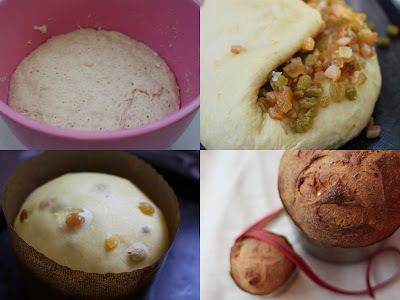 Flatten dough into 15-inch (38 cm) circle; top with raisin mixture. Fold dough over mixture; pinch to seal. Knead for 2 to 3 minutes or until raisin mixture is evenly distributed. Place in large greased bowl, turning to grease all over. Cover with plastic wrap; let rise in warm draft-free place until doubled in bulk, 1-1/2 to 2 hours. Grease two 2 lb (1 kg) coffee cans or panettone moulds. 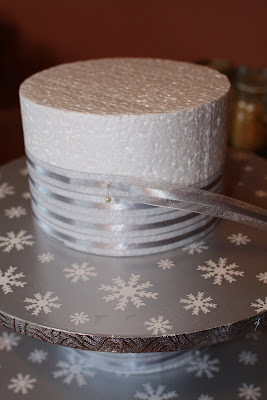 If using cans, line bottoms and sides with parchment paper to extend 1 inch (2.5 cm) above top; wrap outsides and bottoms with double thickness of foil. Punch down dough; turn out onto lightly floured surface. Divide in half; roll each into ball. Place, seam side down, in can. Cover and let rise in warm draft-free place until doubled in bulk, about 1-1/2 hours. With serrated knife, cut X on top of each loaf. Bake on baking sheet on lowest rack of 350ºF (180ºC) oven for about 1 hour or until knife inserted in center comes out clean, covering tops lightly with foil if browning too quickly. Let cool in cans on rack for 1 hour. 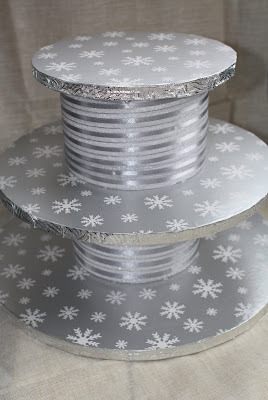 Remove from cans by gently pulling paper; let cool completely on rack. 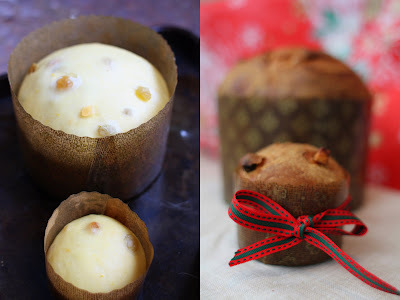 Tip: Baking panettone in a variety of can sizes is not traditional but does allow you to share some of this splendid treat with those at the top of your gift list. 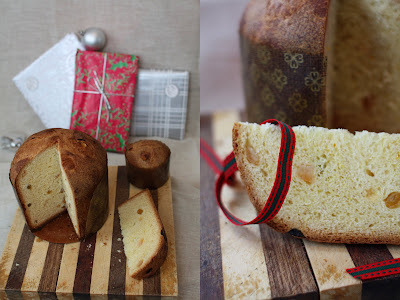 For small panettone, use 10 to 28 oz (284 to 796 mL) cans. Make ball of dough small enough to fill can just under halfway. Let rise as in recipe; bake for 30 to 40 minutes. --My small bake sale fundraiser that I organize every year with a friend raised over $500 that we will put toward providing food for needy families in our area. --Noah made his theatrical debut as a shepherd boy in our church's children's Christmas musical. After weeks of practice, he sang and did the actions, but also behave rather mischievously on stage, much to mama's chagrin and the audience's delight. 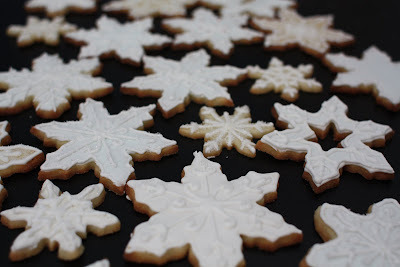 --And then, sandwiched between two snowfalls, my annual cookie swap quietly came and went. How nice to be well-stocked with an amazing assortment of baking! 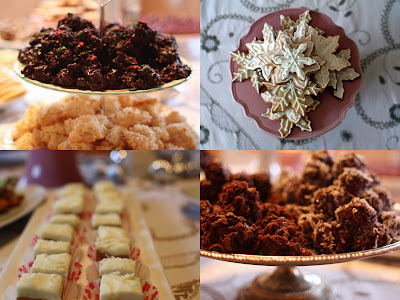 All the cookies were stellar and I was even introduced to a few new ones. Ginger-Lime Buttons, anyone? Yum! It would have been hard to top last years' highly organized exchange that made the local paper, but this year was just as memorable. 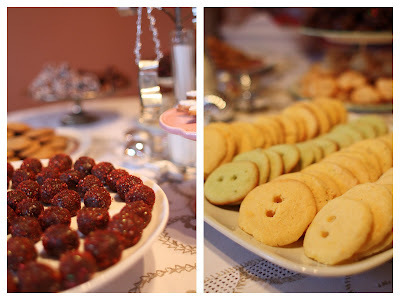 While I waited for the girls to arrive, I brewed my usual batch of mulled cider and set out platters to receive the cookies; I was reminded of what an easy party this was to host! I was so relaxed, as were the guests, and the afternoon slipped away rapidly as we ate cookies and chatted. Many thanks to the girls who came out! We'll see you next year! 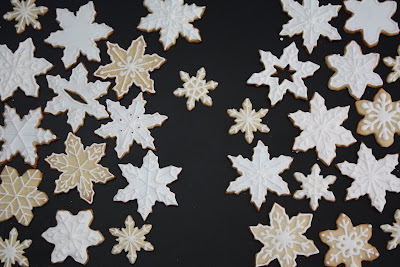 I'm hoping these photos will distract you from the fact that I have no cookie recipe for you. I know, I know, but by now, I'm sure you've either got your baking done or at least have your recipes picked out--you don't need mine, right? Just a week to go until Christmas! There are some great things coming to this blog in the next few days so stay tuned. I absolutely love gingerbread. If I had to pick a favorite holiday cookie, gingerbread would win without question. 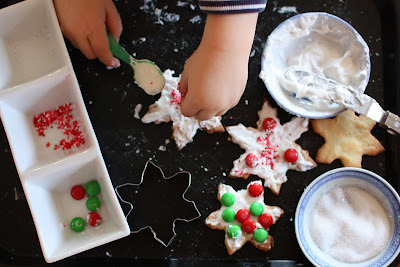 It probably stems from my childhood and good memories of baking and decorating cookies to my heart's content. 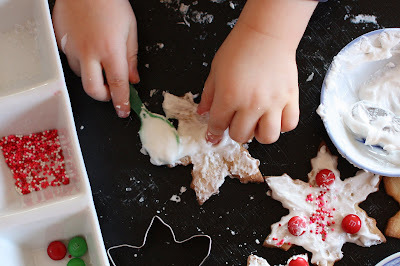 Every step is special, from the measuring of the spices for the dough, to the rolling and cutting of playful Christmas shapes, and perhaps the most fun of all, the detailed icing work. This year I opted to make and decorate gingerbread trees. My heart just hasn't been into elaborately decorating men ever since that fateful Christmas several years ago when my brother-in-law ate the heads off of every single one of my styling GQ gingerbread men as they were drying. It was quite the massacre, no one survived and a small part of me died that day. Of course I made some little guys for Noah to decorate and for ornaments for a wreath, which you can see later in the post. This year I decided to forgo making an elaborate gingerbread house like I have in Christmases past. 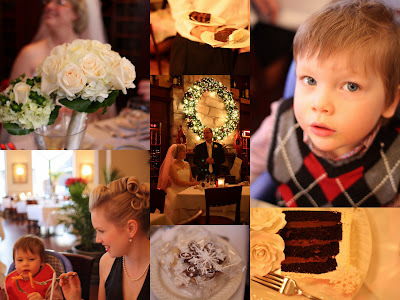 In light of a family wedding on December 20th, and the busyness that inevitably surrounds that event combined with the usual Christmas rush (Rehearsal! House guests! Gift shopping! and Me-oh-my-what-will-I-wear? ), I'm cutting back on my holiday baking so I don't burn out before the big day. Still, Christmas without gingerbread just isn't an option, so I set aside some time to make sure we had a healthy stash. 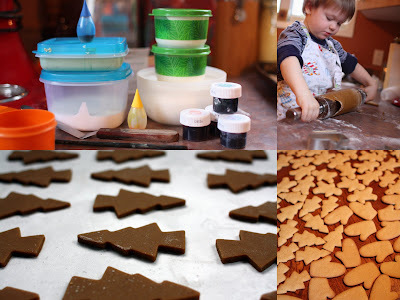 Noah joined me on this task--which turned it into an adventure-- and at the end of the day I was thrilled with our assortment of gingerbread cookies. Stars! Mittens! Trees! Hmm, isn't it funny how things take longer even though you have an adorable 'helper'? 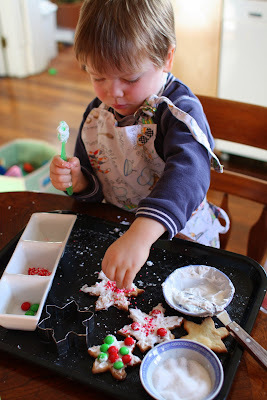 Already a pro from his snowflake sugar cookies, Noah had no trouble dressing up these little gingerbread men while I decorated the trees and mittens. 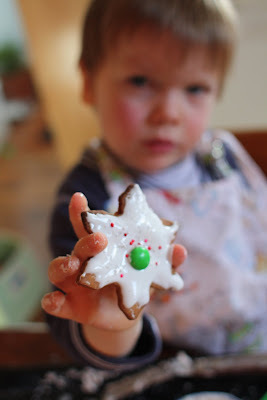 I don't have a photo, but his cookies turned out so cute, I think I'm going to have to shellac a few to keep forever. Maybe I'll make a necklace or something. Oh no! Not more crafts! ...I've been at it again. For the little effort it took, I was pretty happy with how this simple holiday wreath came out. 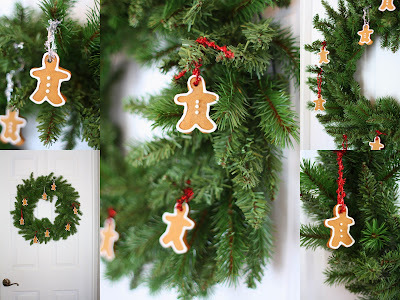 I bought the greenery at Reno Depot for like $8, I think, and dressed it up with a few small gingerbread men. Honestly, these little fellows make my whole living room smell like gingerbread. It's heaven. Before I forget, thanks for all your 'get-well' comments! We are all feeling much better and I am waking up with much less of a man-voice now. This is a new one for me, but I absolutely loved it. I like my gingerbread with a snap to them, but not jaw-breakingly rock-hard. These were perfect. I used Martha's recipe for royal icing, which calls for meringue powder. I recommend using this over egg whites if you are decorating with/for children. 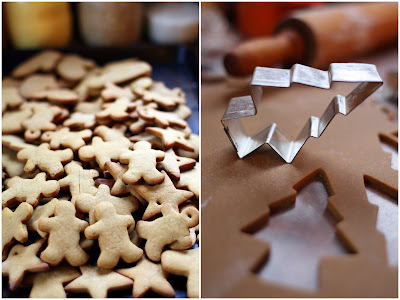 "Of course you don't have to cut these cookies into any particular shape, but if you want to make gingerbread people this is the recipe to use. 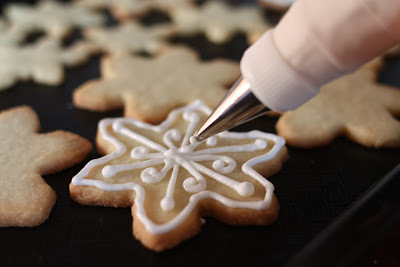 And these cookies are ideal for decorating... A bonus: this dough is so tender that you can roll and reroll the scraps without having to worry that the last batch of cookies you roll will be tough. This recipe makes a lot of dough, but it's easy to halve if you need less. 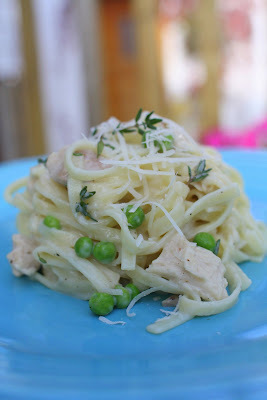 Check out the original recipe and other great recipes on his super comprehensive website. 4. 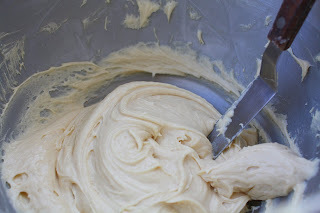 Remove the bowl from the mixer and give the dough a final mixing with a large rubber spatula. 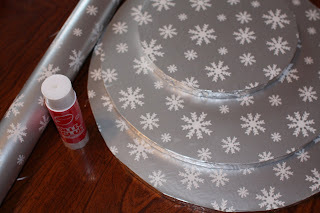 Scrape half the dough onto a large piece of plastic wrap and press it to about a 1/2-inch thickness. Wrap the dough securely and repeat with the remaining dough. Chill the dough for at least 2 hours or for up to 3 days. We were off to such a good start around here with our Christmas preparations, but a vicious head cold has rendered the wee ones and I useless. You know you're sick when the everyday motions become huge hurdles, and you congratulate yourself on having two babies fed and dressed by 11:00 AM. Thank goodness the Christmas cards are almost done, the boxes of goodies mailed to loved ones far away, and the shopping taken care of, or I'd really be freaking out. 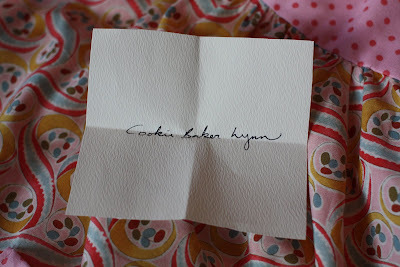 Still, pray that I shake this, because I have a bevy of baking to attend to. On a happier note, we had the prettiest blanket of snow blow in today. With the wind whipping around the eaves, swirling the fast-falling flakes, I was happy to have a mug of this hot spiced apple cider to keep me warm. Look at the fragrant ingredients that make this cider so aromatic: cinnamon, cloves, star anise, bay leaves, ginger and lemongrass. Mmm, it's practically a cure for a cold in itself. My husband likes this cider as sweet as it can be, but if I'm offering it to children, or drinking it while sick as I am now, I prefer to pass on the brown sugar. Feel free to spike it if you like, I won't say I pass on that! 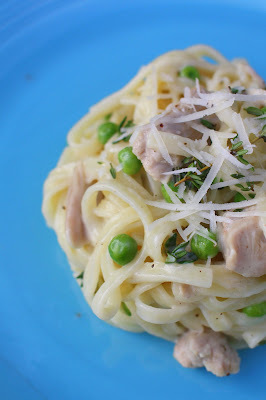 Combine all the ingredients in a saucepan. Place over medium heat, and stir until the sugar has dissolved. Bring to a boil, reduce the heat, and simmer, covered, for 10 minutes. Strain and serve. 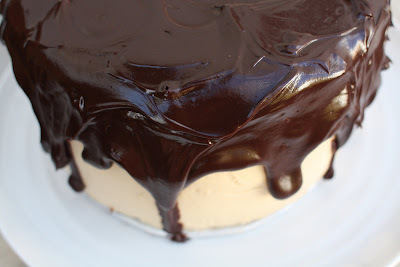 Sour-Cream Chocolate Cake with Cream Cheese Peanut Butter Frosting and Chocolate-Peanut Butter Ganache: if you think that's a mouthful, you should taste this cake. I like dependability in a recipe. I like knowing the outcome is going to be exactly as good as it was the last time. Although my culinary training helps me deal with most curveballs thrown my way, I don't like surprises when I am in the kitchen. For years I've had a chocolate cake recipe as trusty as an old friend. 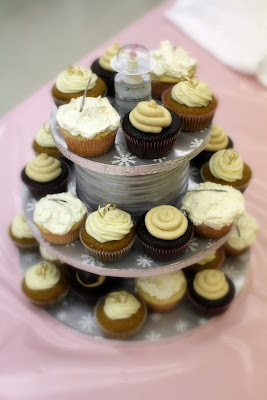 You've seen it in the form of wedding cakes, mini cupcakes and baby shower cakes. It's an adaptable one-bowl chocolate cake, easy to prepare and always comes out moist and delicious. However, as reliable as that cake may be, it's a tad boring, and today I'm tossing out the recipe because I've fallen in love with something new. Yep, my old standby chocolate cake has been usurped by this irresistible Sour-Cream Chocolate Cake. This cake proves that change can be good, even great! First spotted over at Smitten Kitchen, it was love at first sight and all I needed was an excuse for that first bite. Fortunately I didn't have to wait too long for a birthday to come up and a gang of us demolished this cake in a matter of minutes. I didn't even get a photo of a slice. 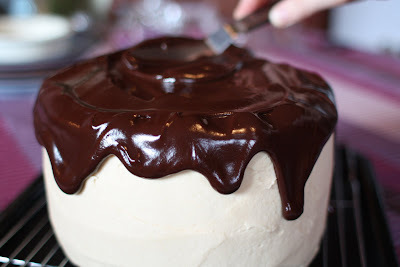 Guess I'm going to have to make it again soon to get one, because it's a gorgeous layer cake. OK, so peanut butter lovers out there--watch out! This cake will knock your socks off. 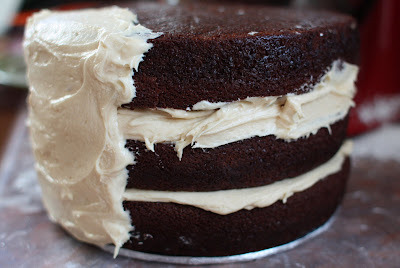 Here's how it comes together: Three ultra-tender, very dark rounds of sour-cream chocolate cake are layered with a sweet and salty cream cheese/peanut butter frosting. 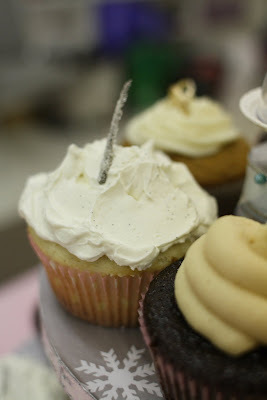 The towering masterpiece is covered with more of this decadent frosting, then smoothed and chilled. 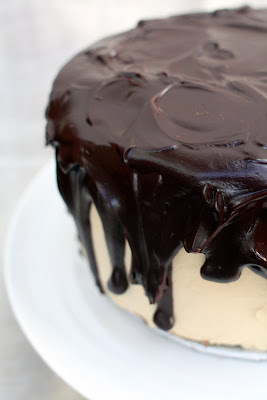 Meanwhile, dark chocolate and more peanut butter is melted into a rich ganache, which is then drizzled, nay, slathered, over the top of the layer cake. How does that sound? As Deb puts it, this cake is intense. A small slice is sufficient and although the recipe says it serves 12 -16, I pleased about 24 people with it. 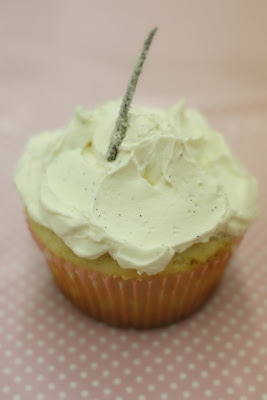 For another occasion I turned this recipe into cupcakes and they were great. 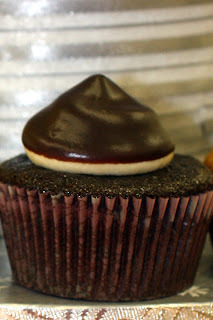 (pictured below) I dipped a few in the glaze, but mostly just decorated them with the peanut butter frosting. 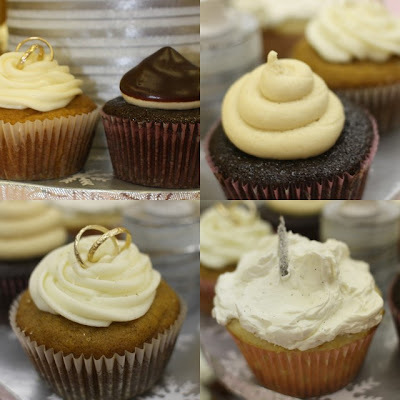 In cupcake form, these treats pack quite the wallop and if you are trying to diet before the holidays, watch out as they could become your latest vice! Makes an 8-inch triple-layer cake; serves 12 to 16-generously. 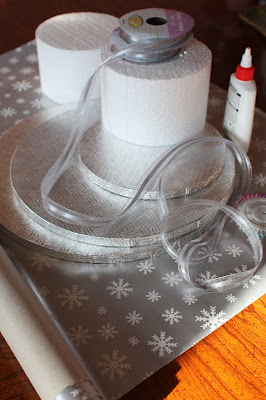 Once the cake is fully frosted, chill it again and let it firm up. 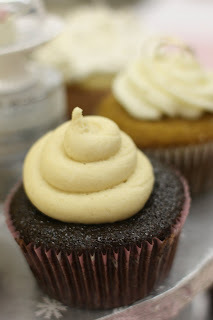 The cooler and more set the peanut butter frosting is, the better drip effect you’ll get from the Chocolate-Peanut Butter Glaze. In case you have any leftover pumpkin puree from all those Thanksgiving pies, here's one last recipe idea to help use it up and then I'll stop with the onslaught of pumpkin posts already! Let me just say, it was not my idea to combine pumpkin with fudge, but rather a request from a good friend who remembered having it as a child and it was 'the best thing ever'. 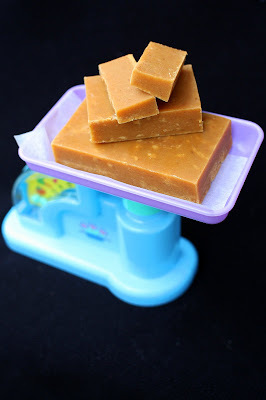 So despite my reservations and although Dave is my arch-nemesis in the game Settlers of Catan, I couldn't say no to his request and went searching for recipes for pumpkin fudge. 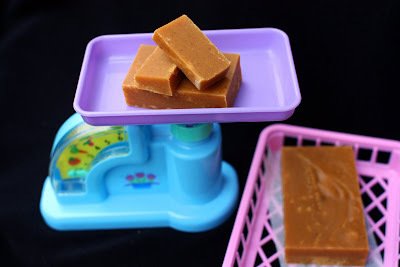 This one on Allrecipes reminded me of last year's Killer Crack Peanut Butter Fudge, and I decided to give it a shot. It had the perfect fudge texture, I couldn't complain about that, but the pumpkin flavor was SO strong, TOO strong--and I love pumpkin! I couldn't figure out what exactly it was about this fudge that I did not like--in fact I almost convinced myself that I DID like it, but after it had sat around for a few weeks (gulp), I had to be straight with myself. "Self" I said, "Fudge is lucky if it lasts 24 hours in this house. Face it. You hate this fudge." Now, why would I give you this recipe? 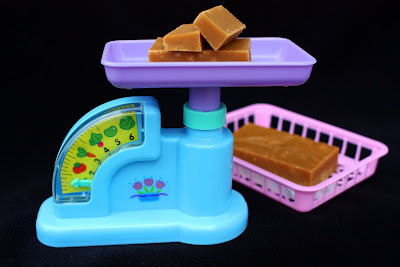 Because taste is subjective and some people loved this fudge. No, not just people who were tying to get on my good side, but real pumpkin pie connoisseurs (you know who I am talking about). 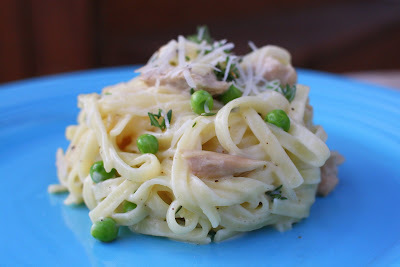 So this recipe is for you. You're welcome. Oh and you were probably wondering, did my friend Dave like it? Was it everything that he remembered and more? Incidentally, today is his birthday though, so Happy Birthday, Dave! 1. 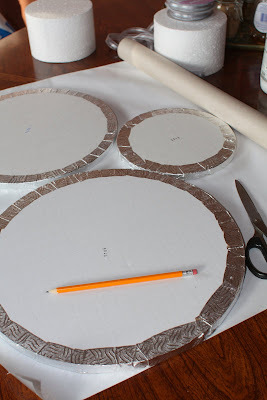 Line a 9x9 inch pan with aluminum foil, and set aside. 2. In a 3 quart saucepan, heat milk and sugar over medium heat. Bring to a boil, stirring occasionally with a wooden spoon. 3. Mix in pumpkin puree and cinnamon; bring back to a boil. Stir in marshmallow creme and butter. Bring to a rolling boil. Cook, stirring occasionally, for 18 minutes. 4. Remove from heat, and add white chocolate chips and vanilla. Stir until creamy and all chips are melted. Pour into prepared pan. Cool, remove from pan, and cut into squares. Store in a cool, dry place. Playing with Pumpkin: the Series.